In this post, we will be talking about Sound Masking, a way to increase privacy in the workplace. Many modern office spaces are designed with an open layout. The idea behind the open concept is to increase collaboration within the organization. These open spaces often increase workflow by allowing each team member easy access to one another. There are drawbacks to the open concept, and that is lack of privacy. Sound is a wave that spreads out in all directions from a source. Walls block it, soft surfaces absorb it and it’s reflected by hard surfaces. Some sounds can cover it up. But unimpeded, sound can travel pretty far. Even soft sounds are easy to hear if there’s nothing to cover or otherwise impede the sound from being detected by your ears. Sound Masking is the addition of an unstructured sound to an environment that fills in the sound spectrum and makes the structured sound of human speech less intelligible. Less intelligible speech = privacy. Usually it’s an un-intrusive sound like airflow, similar to a typical modern HVAC system. The Philm Gear Team can customize for your open work spaces. Block, Absorb or Cover are three ways that can improve your acoustic environment and achieve the necessary privacy. Sound waves can be blocked by using high-STC-rated panels, partitions, windows and walls. Sound can be absorbed by using a high-NRC-rated ceiling tile or acoustic wall panels. Sound can be covered by using a source of unstructured–NOT music which is structured and therefore distracting–low-level background sound, known as Sound Masking or white noise. Most office environments will require some combination of these three tools to provide an acoustically pleasing atmosphere. In most cases, no one tool by itself will solve your privacy needs, however, covering or Sound Masking provides the greatest increase in privacy per dollar invested. It’s even more effective if used in conjunction with the proper mixture of Absorption and Blocking components in order to achieve specific speech privacy levels. Virtually limitless zoning capabilities, easy expansion, and complete system access with the click of the remote or mouse, on site, off-site or around the world. It is best for 20,000 square feet to projects requiring multiple facilities / campus wide installations. 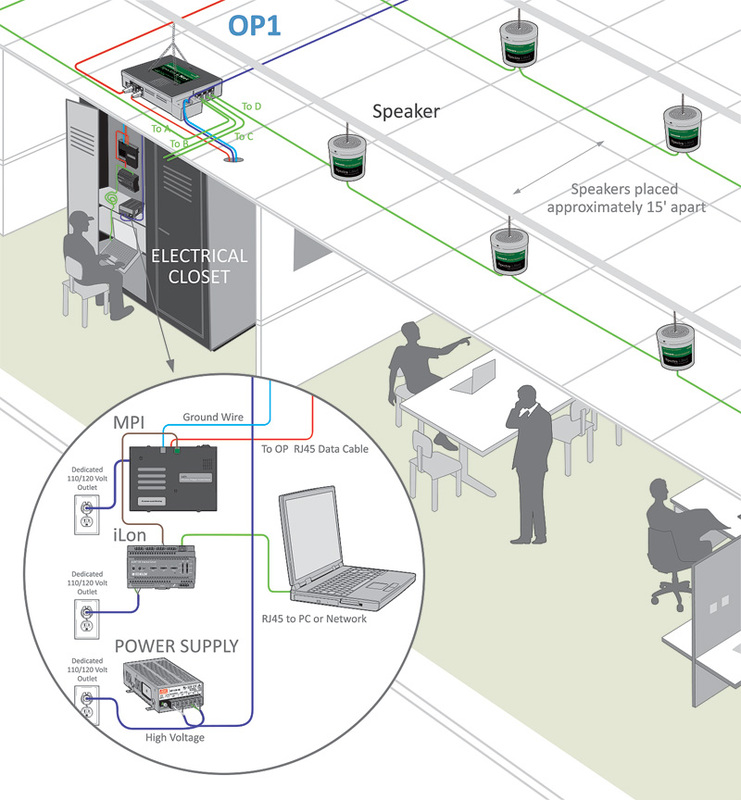 A networked system with plug and play components with real time system access, control, monitoring, and reporting. Provides point-by-point technical advantages in tuning, control and coverage. Our solutions will give you both individualized and central speaker control. Most Sound Masking systems need to be attended to regularly and maintained annually to keep from degrading over time. We ensure sound uniformity with no re-tuning requirements. Most offices have multiple distinct sound signatures (Such as a call center vs. reception area) unlike the competition, our sound masking levels can be customized to areas as small as 225 sq. ft. Most other systems mask in half- or full-floor zones. Because Spectra systems can be so finely tuned, you can be confident in uniform, comfortable speech privacy. All Sound Masking solutions by Philm Gear are UL Listed so that you can be confident that your system will meet code requirements. 3.95.1 (2010) / 3.3.103.1 (2016) Combination System. A fire alarm system in which components are used, in whole or in part, in common with a non-fire signaling system. 3.3.95.1 (2010) / A.3.3.103.1 (2016) Examples of non-fire systems are security, card access control, closed circuit television, sound reinforcement, background music, paging, and sound masking. 6.1 Unless otherwise permitted or required by 12.3.1 through 12.3.7 and 12.6.3 through 12.6.13, all means of interconnecting equipment, devices, and appliances and wiring connections shall be monitored for the integrity of the interconnecting conductors or equivalent path so that the occurrence of a single open or a single ground-fault condition in the installation conductors or other signaling channels is automatically indicated within 20 seconds. 4.3.5.3 Relays, circuits, or interfaces necessary to stop or reduce ambient noise shall meet the requirements of Chapters 10, 12, 21, and 23. Chapter 23: Protected Premises Fire Alarm Systems. As a minimum, where fire alarm systems SLCs are shared with other systems, the requirements of 23.8.2.6 and 23.8.4.3 apply and wiring for other systems must comply with the requirements of the NEC. Special care must be taken to ensure that the function or malfunction of other systems does not interfere with the operation of the fire alarm system. Chapter 24: Emergency Communications System. 24.2.1 The systems covered under 24 are for the protection of life by indicating the existence of an emergency situation and communicating information necessary to facilitate an appropriate response and action. 24.3.7 Conflicting or competing signals or messages from different systems could be very confusing to occupants and have a negative impact on the intended occupant response. Where independent systems using audible and/or visible notification are present, the emergency communications system needs to interface with those systems to effect related control actions such as deactivating both audible and visible notification appliances. 5.1.1 Interconnection of protected premises emergency control functions with the mass notification systems shall comply with Chapter 21. The ADA ensures access to the built environment for people with disabilities. The ADA Standards establish design requirements for the construction and alteration of facilities subject to the law. These enforceable standards apply to places of public accommodation, commercial facilities, and state and local government facilities. Awesome! I have much clearer idea on the topic from this article.